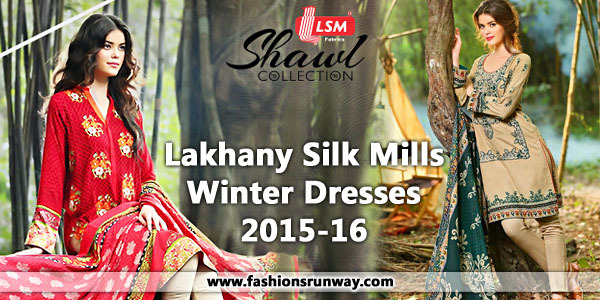 Recently LSM (Lakhany Silk Milks) revealed its Winter Shawl Collection 2015-2016 for this season. First I am going to tell you a short description about LSM. It is one of prominent and leading clothing brand of Pakistan and has a good reputation in Pakistan fashion industry. This clothing mill provides classic and luxurious quality of fabrics for ladies of all ages. This clothing brand comes along with a new innovation and theme each year and on different occasions. Finest quality of materials is utilized for making diverse quality of dresses. This mill started its career in year 1952 and is still in the clothing market for using superior quality material in its all dresses whether they are of any season like autumn, winter, summer and fall. Each attire is completely made according to latest fashion which is liked by its valuable clients. LSM has showcased its collection of winter shawl 2015-16 in different outlets and stores. Women outside Pakistan can also purchase its clothing through online. This winter shawl collection is made by brand Zunaj. This collection comprises of three piece suits and all dresses have been decorated so well plus creative embellished work is done on them. Different neutral color themes are used in winter shawl collection. This collection introduced long shirts, shalwars and warm shawls of different embroidery work. The shawls come along with khaddar and linen shirts and shalwars. Beside embroidery dresses, Zunaj introduced some dresses which are in printed format which are suitable as casual wear. These all dresses are comfortable and very ease to wear. Ladies can also see printed traditional motifs on shirts and shawls of this collection. Catalog of these dresses are available on their website and different outlets which can help ladies in finding their all time favorite dress for this winter season. Prices of these 3 piece suits start from 3500 PKR. Check below here Lakhany Silk Mills Fabrics Winter Shawl Collection 2015-16 for women.